On January 8, 1815, American forces commanded by General Jackson, decisively defeated the British forces as they tried to capture New Orleans. The battle, which took place after the Treaty of Ghent had been signed, effectively ended the war. 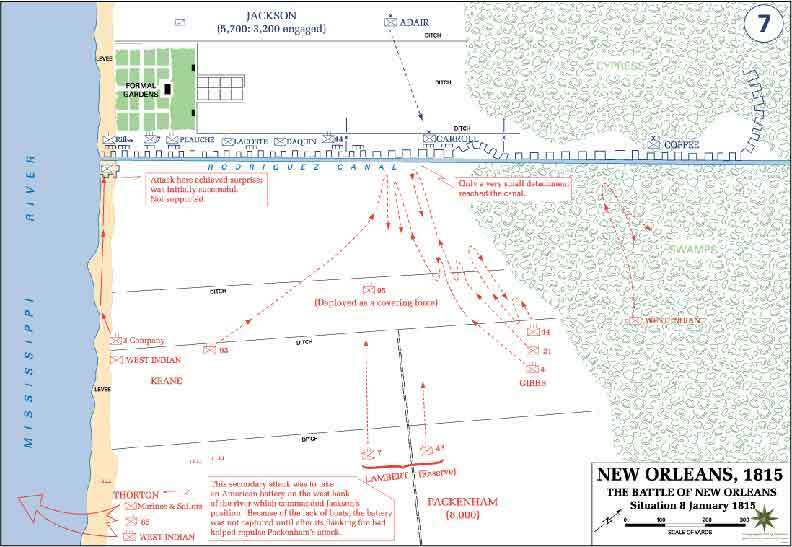 The British chose New Orleans as their last possible objective. They ruled out a water assault on New Orleans and instead decided to mount a ground assault. They anchored their ships at Pea River in the mouth of the Mississippi. Guarding the entrance to the River were five American gunboats. Their 29 guns and 145 were no match for the 45 British barges manned by 1200 men with 43 guns. The American ships gave General Jackson, the commander of American forces in New Orleans, additional time to prepare the defenses of the city. The British troops went ashore at the mouth of the Bayou Bienvenu unopposed. An advance guard of 1500 men moved forward and captured the Viillere plantation. One of the American officers managed to escape and get to New Orleans to warn Jackson. Jackson ordered an attack on British positions. He sent a 14-gun schooner downriver to bombard the British positions, while at the same time ordered General John Caffee to attack the British and try to halt their soldiers on the river. The Americans had some initial success, but ultimately the British lines held. Jackson called off the attack, and his men withdrew to defensive positions along the Rodriguez Canal. This ended the first part of the battle. The two sides then spent two weeks preparing their positions for future battle. The British received a new commander Lieutenant General Sir Edward Pakenham. Pakenham was not happy with the lack of British progress. He developed a complicated plan that involved an attack on both banks of the river; however, crossing the river was more difficult than initially envisioned. It was not until January 8 that a force could dispatch. In the meantime, General Pakenham prepared for a direct assault on the center of Americans lines. General Jackson and his men were ready with well-prepared defensive positions of 4,000 men and well position cannons. At the last minute, Jackson positioned his reserve troops at the exact spot the British were planning to aim their assault. As dawn broke, the British began their assault. The British soldiers gallantly attacked, but the Americans were too prepared, and their artillery wreaked havoc on the advancing British. General Pakenham tried to rally his men and continue the assault even though two horses were shot out from under him and he was wounded. Eventually, he was mortally wounded and died on the battlefield. Within an hour the battle was over. Three British generals and eight colonels were among the 251 British killed. 1,259 were wounded, and 484 were missing in the battle. The Americans lost a total of 11 men and 23 wounded. It was the most significant American victory of the war, and it was against the finest of the British army. It propelled General Jackson into a national hero, which in turn paved the way for his eventual run for the PresidencyThe tragedy of the battle is that it took place after a peace treaty had ended the war.